The financial services sector has been the earliest, and one of the biggest, adopters of the distributed ledger technology (DLT) – more popularly known as blockchain technology. Introduced in 2008 by a little-known person/team/entity named Satoshi Nakamoto, blockchains have grown rapidly in recent years – keeping pace with the burgeoning popularity of cryptocurrencies. According to a March 2017 survey, nearly 8 out of every 10 banking institutions have already started creating their unique blockchain architecture – and it has been predicted that around 15% of the major banking institutions worldwide will become active users of the technology before the end of the year. Given the fact that blockchains can potentially bring down the annual infrastructural expenses of banks worldwide by a whopping $20 billion by 2022, this rapid spurt is not surprising. Blockchains can play a very important role in enhancing the security and efficiency of the storage/transfer of products (perishable goods, in particular). Right from packing and storage, to quality testing and distribution – every activity can be recorded on the distributed ledger, and all concerned parties on the network will be notified about the same. The data that has to be entered by users will vary across the different stages of the supply chain. With blockchains, auditing and establishing the authenticity of each step in the logistics system becomes easier and way smarter than ever before. The volume of data that is regularly collected (and has to be correctly scanned) by us is expanding rapidly. A blockchain-based ledger setup can ease the overall process of data management by both companies as well as governmental bodies – by recording details of different entries, making the data handling tasks simpler and more transparent, and ensuring uniformly high levels of data security. Since the data records in the blockchain are typically time-stamped, the total cost of data management can be cut down upon (and chances of errors become minimal). The analytics information required for different types of applications can also be supported on a blockchain. The technology helps in compliance-related issues as well. The first signs of integrating the blockchain technology in the domain of Internet of Things (IoT) came along in January 2015, when IBM released a proof-of-concept for ADEPT (in collaboration with Samsung). The concept involved the usage of the underlying design architecture of bitcoin for the creation of a decentralized IoT setup. Last August, Chronicled applied the Ethereum blockchain to create an IoT Open Registry. Real-time analytics can be connected with IoT through the edge nodes, while there are several ways in which the usability and interoperability of consumer products can be improved (the DLT can store the identities of the different goods (which would ideally have advanced NFC chipsets)). Predictive maintenance is yet another field in which IoT and blockchain technology can be effectively combined. The latter can be used to detect probable glitches/damages (and generate warning notifications) in IoT devices. The probabilities of hack attacks, hence, would be significantly reduced. In early-2016, it was announced that a decentralized distributed ledger system would be used in the official e-Residency platform (for companies listed on Tallinn Stock Exchange) in Estonia (the announcement was made by the republic and Nasdaq). Blockchains have the potential to play a key role in auditing the ballot boxes in e-voting, thereby recovering much of the credibility of voting systems. A single coin, representing ‘one vote’, will be assigned to each end-user (who would also have his/her credentials in a ‘wallet’). The coin can be ‘spent’ (i.e., the vote can be cast) only once. Apart from keeping fraudulent practices in check, a blockchain-supported voting infrastructure would also be less exposed to online security threats. Blockchain technology does away with the need of middlemen – and that is one of the biggest reasons behind its burgeoning popularity in peer-to-peer (P2P) electricity trading applications. In a ‘transactive energy’ setup, each user will be able to trade (buy/sell) power with neighbors, securely, promptly, and without any hassles. The implementation of blockchains makes the overall ‘power trading’ system high-fidelity. Distributed ledger technology is also witnessing healthy adoption for the exchange of RECs (renewable energy credits). There are several other use cases of blockchains in the power and energy sector, like validating energy trades, managing smart grids, analyzing and benchmarking big data, and trading ‘green certificates’. Metering local energy generation points also becomes easy. With the help of a high-performance software-as-a-service platform, the tasks of recording tracking and transferring information on real estate deeds can be facilitated (that is exactly what Ubitquity does). Real-time notifications about all transactions (as and when they happen) are sent to all the relevant members of the network – ensuring complete transparency and communicability. Professional mortgage companies can also get benefits by developing and implementing blockchains. What’s more, the technology can be integrated with ‘smart home’ systems, to monitor the critical parameters of assets. The distributed ledger technology is, by definition, decentralized, which makes it a great tool for taking the ‘sharing economy’ to the next level. Practically every form of digital information can be supported and stored on blockchains, and activities (irrespective of their scale) can be easily monetized. That, in turn, opens up the possibilities of various types of direct, peer-to-peer transactions – like electricity trading (discussed above), hiring cabs (without the presence of middlemen like Lyft or Uber), data-sharing and providing advisory services. In an ecosystem managed by blockchains, people will be able to seamlessly connect with each other and perform direct transactions. Note: Blockchains are also being used to deliver endorsements, and for the ranking and verification of online reputation of users. ‘The World Table’ and ‘ThanksCoin’ have emerged as major players in this niche. The need for maintaining robust digital security standards is not limited to transactions in the financial sector alone. The open-source distributed ledger technology is expected to make the task of identifying and authenticating users a lot more efficient. All that individual users have to do is create unique identities on the blockchain network, to manage/control the nature and accessibility of their personal data. The technology will assign a ‘digital ID’ to each user – which would help in tracking all transactions of asset(s) in future. Credit report malpractices, cases of online identity thefts and cyber frauds will all go down with the progressive implementation of the blockchain technology. User-identification with the help of biometry tools (like fingerprint identification) is also being facilitated by underlying blockchains. A case in point for this is UniquID. A recent report revealed that, illegal downloads bring down the total proceeds from online music sales by ~85%. Other forms of digital art also face similar risks. To protect the intellectual property rights (IRP) and ensure that optimal returns are obtained from the art collections, the blockchains might well be the best tools. On the network, owners of music and other artworks can upload their stuff, provide a watermark for establishing ownership, and manage/track the transfer of these digital art items. In essence, the availability of a virtual decentralized ledger allows artists to control how, where and when their creations are being used/transferred/deployed at all times. The movement of digital art in a Blockchain framework is similar to bitcoin transactions, and there are no chances of IRP violations. Note: Grammy-winning musician Imogen Heap has created a music-streaming platform powered by blockchain technology. It is called Mycelia. This is one of the newest domains in which blockchain technology has started to make its presence felt. Unlike Facebook or Twitter or any other currently popular social media sites, a decentralized social network (DSN) would not involve any centralized, controlling company/entity – and user privacy will be much higher. The same software can be used for connecting multiple servers in a DSN. Synereo, DATT and Diaspora are some examples of the decentralized social networks that are coming up. Many experts feel that social networking will become more and more decentralized over the next decade or so – and if that is indeed the case, the role of blockchains over here will become increasingly prominent. Infosys has already identified the medical sector as one in which distributed ledgers will have a strong role to play in the foreseeable future. E-medical records can be made more accurate and secure than ever before – and there will be no intermediaries involved for their maintenance. 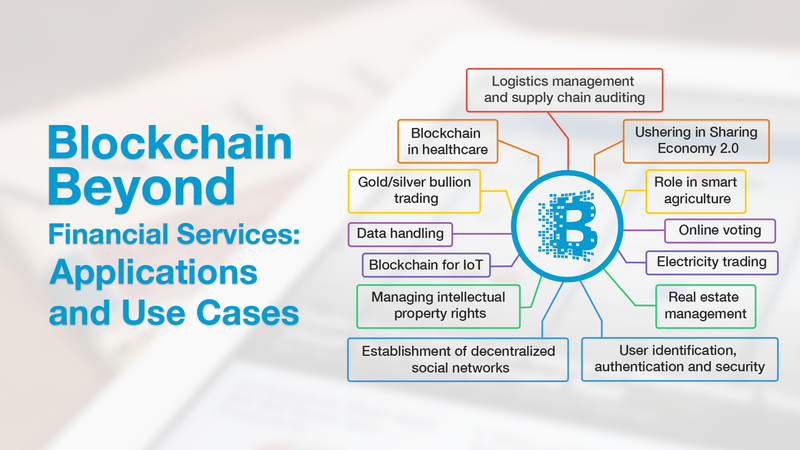 Blockchain’s superior handling of these records is likely to help in the creation of smarter health information exchange (HIE) models. In addition, the new technology has the power to enhance the interoperability of different health records, as well as ease out the processes of testing proof-of-concepts and conducting medical experiments. In a blockchain-supported healthcare system, the patient (with his/her information) is always at the core. A user-friendly investor platform has already been introduced by The Real Asset Company – for the purchase/sale of gold and silver bullion safely and effectively. In the commodities market, blockchains add a definitive edge, by creating secure online accounts for the purpose of buying/holding precious metals. New cryptocurrencies backed by gold/silver can also serve two key purposes: i) create an additional layer of transparency and security on top of the vaulting setup and investments, and ii) facilitating the return of these precious metals in the global monetary system (Goldbloc is a cryptocurrency that does this). Note: Blockchains have also proved to be useful for tackling illegal activities in the diamond trading business. On a decentralized, immutable ledger, all diamond identification records and transaction details are registered. The ‘digital passport’ of diamonds (as assigned by Everledger) ensures their authenticity and helps to create trackable footprints. In several previous posts, we have discussed different aspects of smart, IoT-supported agriculture. This sector can also feature extensive application of the blockchain technology over the next few years. While IoT can boost productivity and yield quality in a big way, distributed ledgers can bring about improvements at various points of the agricultural ecosystem – from establishing fair-trade practices and in-depth auditing standards, to ensuring data integrity and round-the-clock compliance. The overall value chains in the primary sector should become more efficient, visible and fair, with the disruptions caused by blockchains over here. Earlier this year, the International Airport Review has mentioned blockchain as one of the ‘six technologies to revolutionize the airport and aviation industry in 2017’. The technology can play important roles in the job markets (including support for recruitments), for creating cutting-edge network infrastructure and distributed applications, in the worldwide gaming industry (including legal gambling) and for making market forecasts more accurate. Bitnation, the first ever blockchain-technology-powered jurisdiction setup (it is, in essence, a ‘virtual nation’ in itself) was created back in 2014 – and it has citizens and stakeholders all over the globe. Blockchains are, of course, still very important in the financial services market – but their adoption in other fields is growing fast.